One of the biggest occasions where a cake is needed, is for birthdays. It just doesn’t seem to be a full celebration without one. One problem that often arises, however, is that a lot of it gets wasted. This is because it is hard to predict what size cake may be needed. A good solution to this is to have a cupcake birthday cake. 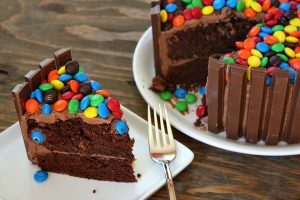 This is a new trend, and even if you are making the cake for this special occasion you can easily make this version of it. All you need to do is determine the number of guests that the cake has to serve. Then you will need to plan on one cupcake for each guest, but you will need to make an even number of cupcakes. Next, go ahead and bake the cupcakes using your favorite recipe and make sure you use paper cupcake holders. Once the cupcakes have cooled, line then up in even rows so they are just touching each other. Now go ahead and ice them as a full group. This means dragging the icing from one cupcake to the next across, and the same downwards. When you are finished and you look from the top down, it should look like a cake. Next, you can go ahead and add the finishing embellishments to the top of the icing. When you are ready to serve, you just reach under the icing and pull out each cupcake in a row as you need them. If this seems too complicated, then most likely your local bakery is now providing cupcake cakes, so you just need to order according to the size you need. If you are really creative, you can create some type of theme with the cupcakes and just use the icing technique as outlined.